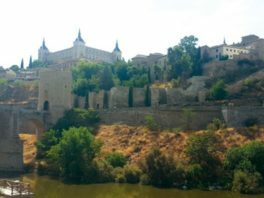 Toledo was Spain’s Capital of Gastronomy in 2016 and the city’s marzipan — Mazapan de Toledo — is so famed that it enjoys Protected Geographical Indication status, which protects the reputation of the regional foods and prevents consumers from being misled by non-genuine products. Manchego cheese, made from the milk of the Manchega sheep, is another Toledo delicacy. For more filling sustenance, Toledo has a number of memorable local specialties. The partridge is featured in two well-known dishes — partridge stew (served hot or cold); and partridge pate. The latter is a rich composition of partridge, pork and herbs, baked to perfection and covered with bay leaves and slices of bacon.